Sept. 27, 2012, 11 a.m. The site wants your help assembling a database of television ad buys in swing states. By Adrienne LaFrance @adriennelaf Sept. 27, 2012, 11 a.m. Political transparency geeks got both good news and bad news from the Federal Communications Commission last April. Good news first: The FCC decided it would require television stations to put information about political ad buys online. The bad news: Only stations from the top 50 markets are required to do so, and stations can post the files as image PDFs — meaning there’s no easy way to search records by the name of the ad buyer from the FCC database. And what good is a bunch of data if you can’t extract meaning? 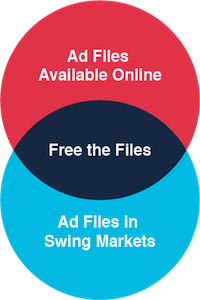 ProPublica is coming to the rescue — it hopes, with your help — with a project launched today called Free the Files, the latest iteration of an ongoing effort to examine political ads and the shadowy groups that often pay for them. Within the top 50 TV markets, ProPublica is focusing on ads purchased in swing states like Virginia, Florida, Nevada, and Pennsylvania. 3. Answer four questions about that document: Who bought it? What agency? How much? What’s the contract number on the ad buy? There are plenty of group names already in the system, so when you start typing “American…” for example, a list of nonprofits or super PACs like American Crossroads pops up. It’s a feature that promotes consistency in data entry in the same way that including a contract number is meant to eliminate duplications. Help buttons attached to each question guide volunteers on properly reading the files. There’s also a box to check if you notice “something else notable” about any given file. But the task ahead is still a major one. ProPublica has more than 15,000 files on hand with 40 short days until the presidential election, and each datapoint on a file needs to be verified by at least two users before it can be officially entered into ProPublica’s database. Developing verification infrastructure has been the biggest challenge for ProPublica’s Al Shaw, who calls the project “one of the biggest and most advanced crowdsourced efforts ever done.” ProPublica is known for its ambitious data projects, but it usually cleans up and organizes data in-house before sharing it with the world. ProPublica isn’t measuring its success based on whether an army of volunteers can work their way through every last last file — although, of course, that’s an outcome the site would welcome. If this effort helps identify even one otherwise unknown ad buyer, that’s a journalistic victory in Zamora’s eyes. The basic strategy: Crowdsource the assembly of a database but leave it to the reporters to take on more complicated and time-consuming legwork and analysis. Already ProPublica has a group of more than 500 volunteers — people who said they were willing to physically visit their local TV stations and send files to ProPublica before the FCC required the stations to do it. For volunteers, incentives are built in all around them. There’s the overarching idea that they’re contributing to important work, but they’ll also get to see the fruits of their labor as it happens. The Free the Files map that they’re populating with data will become more robust with their efforts. There’s also a gamification aspect to the project, which features a leaderboard that ranks volunteers by how many files they’ve freed. Plus, Zamora set up a Facebook group for the volunteers, a place where people can discuss their work, share information about ads they’ve seen in their home states, and so on. ProPublica has had success with crowdsourced projects in the past when they’ve assigned meaningful but doable tasks and created forums that reinforce the strength of the community that’s doing the work. Also, ProPublica frames the mission narrowly — that includes making clear not only the goal but explicitly telling volunteers what not to do. POSTED Sept. 27, 2012, 11 a.m.
LaFrance, Adrienne. "Free the Files! ProPublica taps the crowd for a database-building sprint to election day." Nieman Journalism Lab. Nieman Foundation for Journalism at Harvard, 27 Sep. 2012. Web. 19 Apr. 2019. LaFrance, Adrienne. "Free the Files! ProPublica taps the crowd for a database-building sprint to election day." Nieman Journalism Lab. Last modified September 27, 2012. Accessed April 19, 2019. https://www.niemanlab.org/2012/09/free-the-files-propublica-taps-the-crowd-for-a-database-building-sprint-to-election-day/.